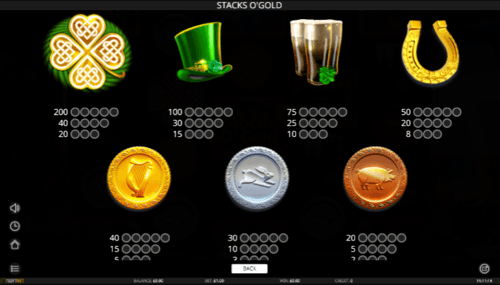 Stacks O’ Gold, an Irish-themed online money slot on ​MoneyReels.com​ comes with an impressive element which requires only 20 coin credits to cover all paylines on each spin. As interesting as the money slot is, adding to its sweetness is the fact that it is playable from 20p a spin on all devices. So you do not have to worry. 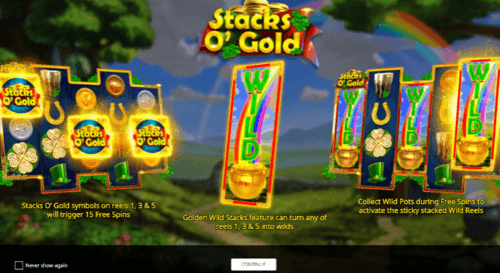 Stacks O’ Gold is a slot that gives you chance to enjoy real money online courtesy of ​Money Reels​. When you talk about this online slot, need be said about the Free Spns feature where you begin with 15 spins. This is to say that, you have to collect wilds in order to benefit from the sticky stacked wild reels and the extra free spins. With this, you are sure of having 5 more free spins as well as 3 sticky wild reels. This online slot also comes with expanding wilds. Playing this money slot exposes you to the rural scene which forms the backdrop to the reels. Here, in the game, you’ll see bronze, silver and gold coins alongside horse shoes, pints of stout and green top hats which give you insight into the beautiful interface. In addition, the standard symbols have a significant role to play in the fun inherent in the online money UK. The best of the standard symbols is the gold four-leaf clover which will get you 1, 2 or 10x your stake, only when you luckily land a 3, 4 or 5 in a combination. The glossy visuals dominant in the slot are beautifully done and there’s a gentle harp-heavy soundtrack playing in the background for a delight that throws you into excitement which is present on ​MoneyReels​. 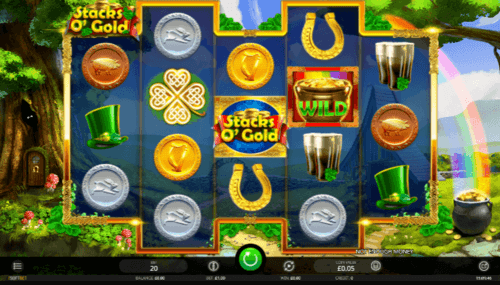 Stacks O’ Gold is an Irish Folklore themed slot game designed with amazing graphics and animations for your playing pleasure. The graphics give you an unadulterated feel of the lush green grass with a nice rainbow to suit beauty. Some of the symbols you'll find are the likes of; top hats, horse shoes, silver coins, gold coins, gold clovers, and pints of stout. For you to have the substance of playing any slot game right in your pocket, there is the highest paying symbol which is the golden clover. It awards 10x your stake for a five-symbol combination. On the golden reels of Stack O’ Gold slot, you can set your stakes on the Bet Field, then click on the Spin button to start your gameplay. To land winning combinations, you have to aim it from left to right of the slot grid. Stack O’ Gold comes with a Return To Player RTP of 96.17%. Free Spins feature – To get the best this has to offer, all you have to do is to land the bonus (the Stacks O’ Gold symbol) on reels 1, 3 and 5 and you’ll be awarded 15 free spins. Every time 1 hits, it is collected in a meter. Once you have 6 of them, you’ll receive 2 extra free spins, making reel 1 turn into a sticky wild and it remains that way till the feature lapses. What happens when you collect 10 wilds? Simple! You will see reel 3 turning into a sticky wild reel with another 2 free spins added to your tally. Should you now get another 10 wilds on reels 2, 4 and 5 luckily, then you are already at a spot where reel 5 becomes wild and sticky too, and 1 more free spin is added to you— exactly what is called Sticky Stacked Wilds Reels feature. Do you know Special Golden Wilds can trigger randomly at the beginning of any free spin too? Of course, they can! What these symbols do is turn reels 1, 3, or 5 wild for free spin that follows. Wild Symbols With the Pot of Gold as the wild card of the game, all other symbols are replaced, especially the Scatter symbols, to help form winning combinations. On the game slot, spins are so important and available like other online slots. So, collecting an additional 10 wilds on reels like 2, 4, and 5 will turn the 5th reel sticky and an extra spin is awarded. Payouts When one considers the RTP as mentioned, one will see how encouraging it is, and the symbols too. Most of the symbols, which are drawn from the Irish traditional culture, have the same reputation as stance for a great game slot. This claim is evident in the game and also a plus to every player, because they symbolize luck. The symbol that rewards highest is the golden four-leaf clover which pays up to 200x your bet just for a 5 combo. The green hat pays too; up to 100x, the dry stout beer pays up to 75x, the golden coin pays 40x. The horseshoe, golden, pays up to 50x, silver coin, 30x while the bronze coin pays 20x. iSoftBet, a London based online and mobile casino supplier, founded in 2010 has already gathered respect and good reputation from prospective clients in the gaming industry. Games at iSoftBet have reasonable gaming limits which doesn't still negates the fun in the process of playing. Hence, amazing experience from this gaming provider assures a better balance in the future. A quick look at Alice Adventure, Astro Magic slot game, Joker Stacks, Illusions 2 uk slot, which are products of iSoftBet would make us realise the features they have in common. Like free spins, how their wilds operate to give slot players the fun they need in online slots. Their RTP are somehow amazingly common, which is why ​MoneyReels.com features this game for you and just you. ​Gameplay on devices This online slot is available on Desktop, Tablet, Mobile with JS, HTML5 technology which gives you the interface you have always envisaged.